To enlarge the pictures click on the photographs. Begun in May 1939 and designed by the architect E. Bower Norris of Stafford, this red brick, neo-romanesque style church was needed to accommodate the growing numbers of Catholics in the parish. The previous church, built in 1893 as a ‘temporary’ church, is still in use today as the church hall. 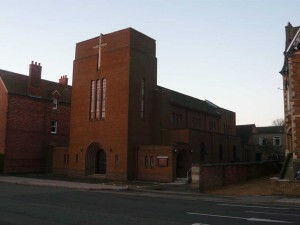 The church cost £11,000 to build and was officially opened and blessed in October 1940. It was consecrated September 1946. Neo-romanesque architecture is a style of building particularly popular in the late nineteenth century and was inspired by the Romanesque style of architecture from the eleventh and twelfth centuries. Popular features of neo-romanesque architecture include round arches and semi-circular arches on the windows. These can be seen in the design of St. Edward’s. The stained glass windows were created by Pearce and Cutler of Birmingham and primarily use the traditional mediaeval colouring of royal blue, ruby red and gold. The clear glass is rippled or waved, helping to diffuse but not cut down the clear light, while obscuring the fact that the church is surrounded by other brick buildings. Traditionally Christian churches are orientated with the altar at the eastern end of the church. Unusually, however, St. Edward’s has the opposite orientation. The altar lies at the western end of the church and the main entrance is to the east.